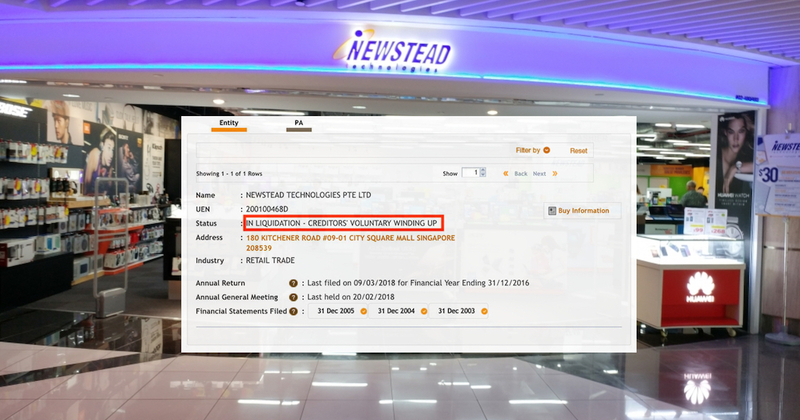 In a press release on Tuesday (Oct 9), local IT and electronics retailer Newstead Technologies confirmed that it was placed under provisional liquidation last Thursday. Acres Advisory’s Tee Wey Lih was appointed as its provisional liquidator and, together with its management team, they have completed a reorganisation of the business. Newstead has retained 60 per cent, or 150, of its 250 employees. This works out to 100 employees that have been retrenched. According to Newstead, it was still “business as usual” at all 10 Nubox outlets and selected Newstead stores. A Facebook post by a customer revealed that Newstead has closed down its Marina Square and Suntec City outlets. In response to this, Newstead simply replied by pointing him to its other outlets at Jurong Point, Nex and Sim Lim Square outlets instead. Channel NewsAsia also revealed that its City Square Mall outlet is still in operation. “The company will continue to honour all transactions and service commitments during this transition period,” it said. Newstead added that it is currently in talks with investors to find a workable solution for all parties involved, and a creditors’ meeting has been scheduled for Nov 2. It is unclear how much debt the company has incurred, but a delivery driver for an electronics supply company told The Straits Times that Newstead owes his firm $3,000 for an order of hard disks delivered two weeks ago. In the press release, Newstead also did not directly address whether it would continue with its commitment at the new Funan mall. Newstead was slated to be the largest IT anchor tenant there, with multiple concept stores spread across 15,000 sq ft. The new Funan shopping centre is set to reopen in 2019 and homegrown electronics retailer Newstead Technologies was set to be the largest IT anchor for the mall. 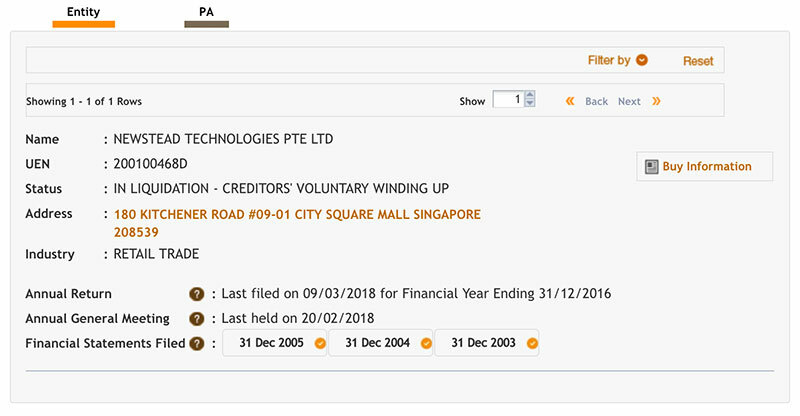 But on Monday night (Oct 8), Newstead Technologies was listed on the Accounting and Corporate Regulatory Authority (ACRA)’s business filing portal as “in liquidation – creditors’ voluntary winding up”. This means that the company’s assets will be collected and sold in order to pay off its debts. Any monies remaining after all debts, expenses and costs have been paid off will be distributed among the company shareholders. When the winding up has been completed, the company is formally dissolved and will cease to exist. Though companies may be legally compelled to wind up, shareholders or the creditors of the company can themselves apply to wind up the company in proceedings. This is known as “voluntary winding up”. A spokesman for CapitaLand, which manages Funan, told The Straits Times that it had not yet heard from Newstead about its liquidation. Established in 1998, Newstead started off with shops at Sim Lim Square and the old Funan DigitalLife Mall, before expanding to other malls such as Marina Square, Nex, Suntec City and Jurong Point. It grew to become a household name for IT and electronics, and manages over 15 outlets islandwide. At the peak of its business, it had more than 40 outlets. Apart from the Newstead brand, the company is also behind Apple reseller Nubox, lifestyle retail concept store DigitalStyle, and computer repair service @notebook.com. According to a spokesman for Sim Lim Square, a mall where Newstead runs 16 stalls, said that Newstead’s stalls were still serving customers on Monday. However, another spokesman for an organiser of IT shows which Newstead has been a major participant of for almost two decades, said that the company had pulled out of an upcoming November IT fair. Despite the flurry of discussion online surrounding the issue, there was no sign of the retailer’s troubles on its Facebook page. As recently as last Friday, posts continued to be made advertising several of its products. A five-year employee of Newstead told TODAY that his company manager had “delivered news that the company was in trouble” last Friday. So far, “about 10 to 20” staff members — mostly staff from the fourth floor of Sim Lim Square — have been let go.